Near-naked butts are fine, but the smoking kind are now off limits at almost all San Diego beaches. The most recent prohibition against butts and smoking on beaches comes from San Diego’s northernmost city, Oceanside. And although tickets are not currently being issued there, signs will be going up after Labor Day advising everyone of the ban on smoking at Oceanside’s beaches. This recent legislation was a result of 9000 residents responding last year to city survey, and coming out in support of the smoking ban. 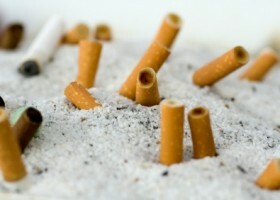 Butts belong in ashtrays or britches– not on our beaches. It seems many don’t like the idea–or reality–of their local beaches being used as an ashtray; however, the smoking prohibition will likely not be enforced by lifeguards (at least as of this writing), who are charged with water and personal safety. They might, however, remind errant smokers if complaints are made. Oceanside joins other cities including San Diego, El Cajon, Imperial Beach, National City, Del Mar and Solana Beach in prohibiting smoking in their parks and/or at their beaches. Encinitas has yet to ban smoking at its beaches–and smoking is currently allowed at the State Beach in South Carlsbad. I agree with this move, the beach is such a beautiful place to relaxed and sometimes smokers ruined this pretty event.